Efstathios Belevonis is a male midfielder from Greece, who has been playing for Panaitolikos in Greece since July 1, 2017. Until now, Efstathios Belevonis has been present in merely one game. He is three years younger than than his team's average age, as he was born on 06.02.1998. In Super League (Greece), Panaitolikos is in seventh position and in Greece Cup (Greece) of group Gr. 3 they are in third place. Altogether, Efstathios Belevonis was substituted in only once and out not once. Currently, he entered the pit more than he left it which is different to last season wherein he showed an equal amount of both types of subs. Apart from Efstathios Belevonis, Jorge Diaz, Franco Mazurek, Ilias Gianniotis, Guga, Frederico Duarte, Adrian Oscar Lucero, Dimitris Dalakouras, Tasos Tsokanis, Angelos Tsingaras and Marcos Paulo are also midfielders of Panaitolikos. So far this season, he lost 50% in Super League and tied 67% of Panaitolikos'' matches in Greece Cup. They also managed to win 2 fixtures in a row in Super League. Ever since Efstathios Belevonis became a professional, he has been committed to exactly one club. 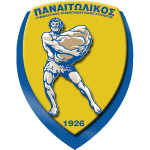 Panaitolikos is his first professional club he has played for. In his footballer career, not a single card was ascribed to Efstathios Belevonis. It's been 234 days since he played his latest match. His jersey displays the number 98. Efstathios Belevonis's longest stay in a team counts one year and 10 months in his current club. His shortest spell with a club currently counts ten months in his latest side.